To contribute towards the Irish Cement CO2 reduction target fundamental changes were necessary to our 70 year old portfolio of Portland CEM I Bulk and Packed cement products. Traditional Portland CEM I cements are based mainly on clinker produced by burning limestone and silica materials at high temperatures in a kiln. This production process results in carbon dioxide emissions arising from the de-carbonation of limestone and combustion of fuels. In order to reduce the carbon footprint of the product portfolio, Irish Cement has replaced traditional Portland CEM I Cement Bulk and Packed products with new CEM II Eco-efficient cements in recent years. In the new CEM II products, between 10% and 20% of the clinker is being substituted by ground un-burnt limestone in the final cement product. This reduces both “process” carbon dioxide emissions arising from the de-carbonation of limestone and “fuel” emissions arising from the burning at very high temperatures (2000oC gas temperature) of the raw materials to produce clinker, thereby substantially reducing carbon emissions per tonne of cement. 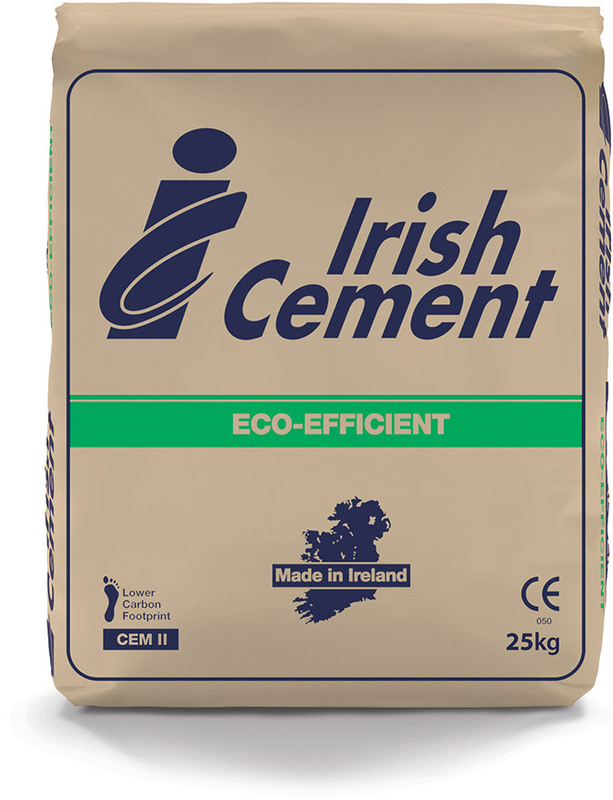 Originally introduced into the Irish marketplace in late 2006 following substantial R&D and field trials, Irish Cement CEM II products have been specifically formulated and produced in accordance with the European standard EN197-1 to give the same performance as their CEM I predecessors whilst simultaneously addressing the need for a more sustainable product portfolio. As illustrated below, CEM II Eco-Efficient Cement sales account for approximately 90% of the Irish Cement product portfolio in the Republic of Ireland. The green credentials of CEM II has been underlined by the involvement of Irish Cement in supplying CEM II Eco-Efficient cement to the first zero carbon emissions concrete house in Ireland. Limestone was chosen as a main component of the CEM II cement products with sustainability as the central consideration. The ready availability of limestone at both Irish Cement Works in Limerick and Platin will ensure that Irish Cement CEM II products will continue to be consistently and securely available for customers for many years to come. The introduction of CEM II Eco-Efficient cements is one initiative within an overall strategy by Irish Cement towards improved sustainability of its activities. Together with recent investments in energy efficient equipment, as well as the forthcoming programme to substitute imported fossil fuels with specially prepared alternative fuels, the introduction of CEM II Eco-Efficient cement products is part of the Irish Cement strategy of securing Irish employment into the future. Cement is the key constituent in concrete and, with new European laws being prepared and enacted which focus on the requirement for improvements in the energy efficiency of buildings, never before has the environmental benefits of using sustainable concrete in our built surroundings been more important to society. As the second most consumed material globally (second only to water), multiple opportunities arise from the use of concrete in many climate change mitigation and adaptation strategies. The unique benefits of thermal mass associated with concrete used in buildings will contribute significantly to tackling the 40% of global greenhouse gas emissions currently arising from the inefficient usage of energy in heating and cooling of buildings worldwide. CEM II cement products are available in Bulk and Bagged form from the Irish Cement facilities in Platin, Drogheda and Castlemungret, Limerick.